Frustrated by the cost and inflexibility of monolithic enterprise storage solutions, the Institute of Physics at the Jagiellonian University deployed SUSE Enterprise Storage based on open source Ceph technology to provide a software-defined storage landscape. The solution removes the dependence on a single vendor, enables the Institute to add capacity faster and in a more granular way, and creates a sustainable platform for data storage that eliminates the need for major investments every few years. 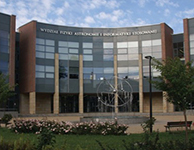 The Marian Smoluchowski Institute of Physics offers advanced scientific edu- cation and research facilities to undergraduate and postgraduate students. The Institute is part of the Jagiellonian University in Poland, founded in 1364 and today providing education to more than 40,000 students in 80 fields of study across 16 faculties. Physics is increasingly a data-driven science. Each year, the Institute of Physics at the Jagiellonian University needs to store and manage larger amounts of data from experiments and simulations. Traditionally, the Institute had used enterprise storage solutions, and while these performed well, they presented a major challenge in terms of economic sustainability. Most departmental budget comes from small grants to research teams, making it difficult to plan and manage capacity—not only because of the large investment required to replace storage solutions every few years, but also because of the high cost of upgrading during the cycle. Seeking greater flexibility, easier management, and more granularity in adding storage capacity, the Institute set out to deploy a software-defined storage solution that would eliminate vendor lock-in and the need to make major investments in completely new solutions every few years. Wary of remaining dependent on any individual vendor, the Institute wanted to deploy an open source solution and identified Ceph as the leading software-defined storage platform. By choosing to deploy SUSE Enterprise Storage, powered by Ceph, the Institute has kept its options open while gaining enterprise-class support from SUSE. The Institute will continue to use its previous enterprise storage solution for several years to depreciate its investment. All new storage requirements will be served by SUSE Enterprise Storage, which the Institute has deployed on mid-range servers from HPE and Dell. In the future, the Institute will expand storage using hardware from other (including local) vendors. Starting with a 20 TB deployment, the Institute initially used its software-defined environment to back up servers and to store surveillance video from CCTV. It is now adding data from new scientific experiments and will also use SUSE Enterprise Storage to host its large server virtualization platform. While end-users experience no difference in terms of performance or availability between the new software-defined landscape and the previous enterprise storage, the flexibility and ease of management have both dramatically improved for the system administrators.